Had anyone told me 5 years ago that my lab would be heavily engaged in peptide chemistry, I would not believe a word… Fast forward to 2013 and here I am, together with my man Ved Srivastava of GlaxoSmithKline, organizing the next American Peptide Symposium. What a turnaround. 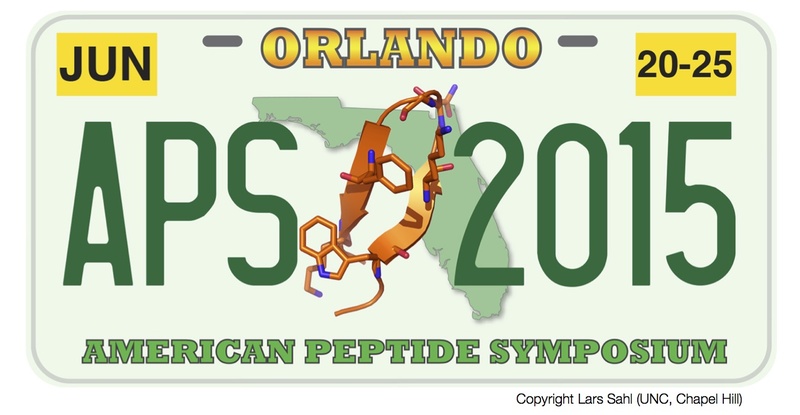 Here is an early-bird invitation to everyone who is interested in peptide science. Come to Orlando in June, 2015! We will have a splendid conference prepared for you. Our logo is below and a link to the website is forthcoming. So, bring your significant others and have some fun in Orlando with us. Besides the scientific program, Ved and I will work hard to ensure that entertainment is taken care of. I will bet that there will be some nice Cuban food, cigars, and so on. This past APS meeting was held on the Big Island of Hawaii and it was awesome (kudos to Marcey Waters and David Lawrence). The only downside was that it was a bit too far and many people could not make it (especially industry folks who just could not convince their upper management that there is science in Hawaii). Orlando, on the other hand, is strategically placed to embrace both the European and American contingents. I will also start spilling the beans about some special features we have in store for your amusement… As part of the conference, we are preparing a cool new 2-hour section called “rapid-fire”. At the beginning of the conference, the attendees will be given a chance to email the organizing committee two slides with their latest results. Of course, you need to consider the pros and cons of this disclosure. We will then select speakers and give them 5 minutes each in the rapid-fire section. 2 slides, that’s it! This is going to be a new mechanism to give floor to young researchers such as students and postdocs who may have a cool result, but perhaps not enough material for a full-scale oral presentation. This lack of a full story is often the reason for one’s reluctance to submit an abstract for a talk. The rapid-fire section will not have a pre-announced program. We plan to call the chosen speakers from the audience during the allotted time. These are our plans and we’ll see how they materialize. We certainly hope they do! We fight entropy every day but it costs us in enthalpic terms… Whenever I notice papers where order emerges from chaos, I pay attention. Here is a really fabulous example from the lab of Michael Rubin (Kansas University). This is coming from another one of the talks I heard while attending the Heterocycles conference in the south of Russia last week. 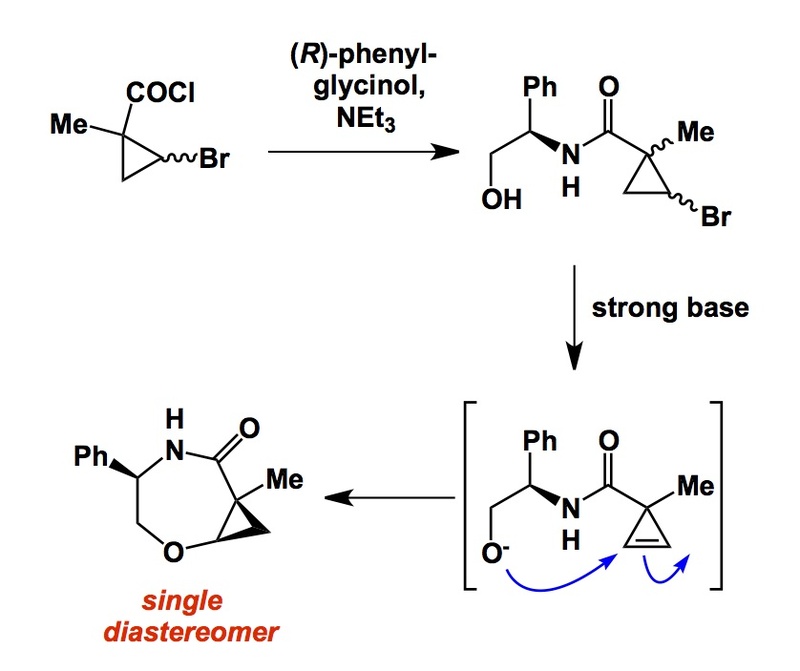 Take a look at what’s happening – it is a neat trick: you start with a racemate, you don’t make your life any easier at the next step when you create an awful mixture of diastereomers while installing the amide bond. However, the subsequent step clears it all up as the base does two things: it eliminates HBr and creates the ring system. The coolest thing is that all the unwanted diastereomers converge onto a simple symmetrical sub-structure that is ready to undergo addition. The addition step is not as trivial as one might think because you do not have a typical conjugated olefin. Strain drives it, though (all 52 kcal/mol of it). Michael presented some compelling evidence showing favourable orbital overlap during the addition step (what is it, by the way, endo addition? exo? trig? dig? what? not so straightforward…). Diastereoselectivity is high and is governed by the conformational preferences dictated by the chiral amide. I think all students will appreciate examples of this sort: you have an awful-looking TLC that goes clean towards the end! I think one of the most important things scientists need to do is know how to rest well. Going to the gym is hugely important, yet not always possible. I think that the best thing I have ever done in my career was to adopt something Prof. Ian Manners (now at Bristol) taught me several years ago, namely not to go to office on Wednesdays. Just work from home, he said. This simple change has made a world of difference because it has turned into a mechanism to work on manuscripts, grants, and to read at home. I feel the need for this extra time now that I am on sabbatical and actually do go to work on Wednesdays! What an irony. I really miss my Wednesdays off and there is definitely a feeling of being overwhelmed with all the stuff such as administrative responsibilities, writing reference letters, and so on. So, if you read this, trust me because this is well tested: if you become a Prof. (which, sadly, will mean that you will spend way less time on thinking about research compared to your time as a postdoc or as a graduate student): skip work once a week. When I was in Russia last week, I talked to Valery Fokin, my old friend (now a Professor at Scripps), who told me that he has now also adopted this method. Valery does it even better, I have to say: he does not open email at all on Wednesdays. When I am back from my sabbatical in January, I will give this a shot, there is no question about that. It took me a while to find this method (thank you, Ian Manners!) and it works… You know what Churchill said: “We always come to the right decision, having tried everything else first”. Right now I want to make a distinction between co-crystallization and soaking of crystals. 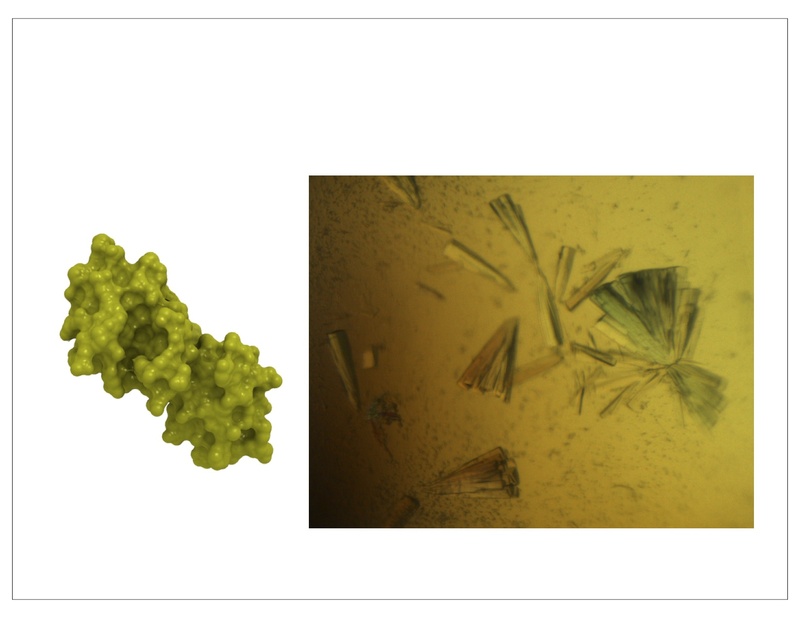 Co-crystallization is when we attempt to crystallize a protein along with its small molecule binder. If anything, this can actually help us in the case of Fxr1 (above) as there is a chance that the molecules we designed will improve the crystal quality. On the other hand, soaking is when you already have good quality protein crystals and place them into a solution of a small molecule. The idea is that a small molecule diffuses into the lattice and “gets stuck” in places that are not random. This is a blueprint for the discovery of new probes for proteins that have no cognate ligands. Tomorrow is the day when I am going to “cross the Rubicon”: we intend to run soaking experiments together with Dr. Aman Iqbal. Aman is an expert in soaking, having arrived to SGC from Astex in Boston. Recently, Aman managed to get a co-crystal for one of our joint targets. Tomorrow is the time to soak another one of our target proteins in cocktails of small molecules. We intend to produce around 80 crystals and analyze them by X-ray crystallography to find binders. While I was away in Russia, Conor, Rebecca and Shinya worked hard and made a library of structurally advanced fragments. In addition, we got some really cool compounds from Prof. Laurel Schafer (UBC) and her Ph.D. student, Andrey Borzenko (by FedEx earlier today). I hope we will collaborate with more people who have nice heterocycles and are keen to understand how they interact with complex protein targets. I am particularly hoping to have something interesting going with Laurel’s nice molecules. I will blog about her methods at some point. I think it is fair to say that our heterocycle-related methodology these days It is geared towards filling the holes on protein surfaces. This is fun. I am still in Pyatigorsk. Valery Fokin, one of the founders of click chemistry gave a talk earlier today. 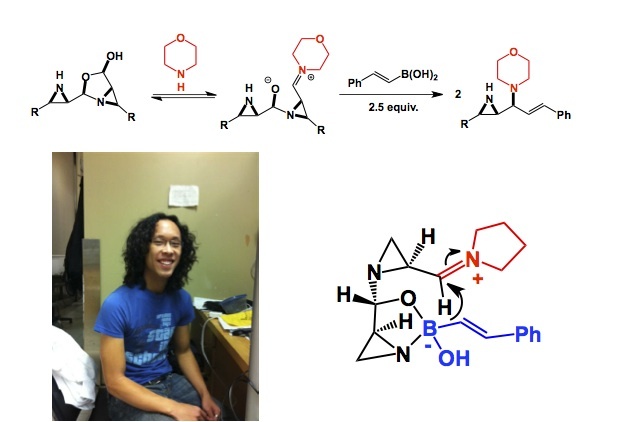 In it, Valery shared the results of a mechanistic investigation aimed at understanding the inner workings of the copper-catalyzed [3+2] cycloaddition between azides and alkynes, one of the workhorses of bioorthogonal chemistry. The Cliff notes summary of his study is shown below. We need to think about two distinctly different roles of copper here. One is to make the terminal copper acetylide, whereas the other one – to recruit the azide. Together, the two conspire to fuse the 5-membered ring. The methodology used to collect some very complex kinetic data is what interested me the most. Microcalorimetry was used, which is a method that enables one to follow step-wise changes in enthalpy as the reaction progresses. Donna Blackmond has done some nice foundational work in this area.